Allowing your baby to join an adoptive family can be a caring and positive choice for your child’s future. Most people know that a woman who chooses adoption loves her baby and is making a very brave sacrifice for her child’s future. Giving birth to a baby does not always mean you are ready to be a mother or father. You are giving your baby a gift no one else can: the gift of life. It hurts to think that as much as you love your baby, you may not feel ready or able to be a parent right now. The adoptive parents you choose will provide the loving, stable, secure home you wish for your baby. You may wish, “If only things were different!” Yet it is important that you make your decision based on what your life is like right now. Making the choice to place your baby for adoption may be one of the hardest decisions you ever make. We understand what you are going through and will be there to support now and in the future. Right now, am I able to provide for my child’s financial, emotional, and physical needs? Will having another baby affect my ability to care for any children I already have? Am I ready now for parenthood for the rest of my life? Will I have to depend on my parents to help me or babysit for me a lot of the time? Do I really feel ready to be a parent by myself? Will the people who say they will help me REALLY help in the long run? It is normal to feel sad even if you know you have made the right choice. Making an adoption plan for your baby involves a loss and a sense of sorrow. Accepting the fact that, at this time in your life, you may not be ready to raise a child can be painful. Knowing your child is part of a stable, secure, and loving family can help give you peace of mind. If you are facing unplanned pregnancy and considering adoption, it is important to gather as much information as you can about every possible choice, so that you will make a loving, intelligent, and fully informed decision regarding your child. 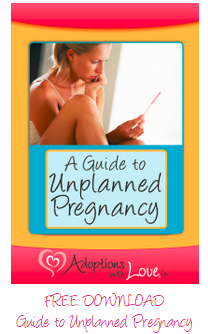 Follow the link below to our free Guide on Unplannned Pregnancy. To help you move forward, we have collected all of the facts, alongside step-by-step considerations and questions to ask yourself, which will help prepare you for this journey.